Home Internet Tips & Tricks Social Media Tricks How to use multiple Twitter accounts on the same computer or mobile phone? Twitter allows us to have multiple accounts. This may be useful for users who would like to have a personal account and a business account. This is ideal for bloggers and website owners as well for promotions and Social Media marketing. It is ideal for your users and followers to identify you by the business name on Twitter that your personal account. Each Twitter account must have a unique email address associated with it. An email address can only be associated with one Twitter account at a time. How to login to multiple Twitter accounts using web browsers from the same computer ? If you have multiple Twitter accounts and you need to login from the same computer then you can do so by using different browsers. Since we can login to only one Twitter account on a browser, we can use another web browser to login to another Twitter account. For example, you may login to the first Twitter account on Google Chrome browser and the next Twitter account on Firefox web browser. Both the web browser are running on the same computer. 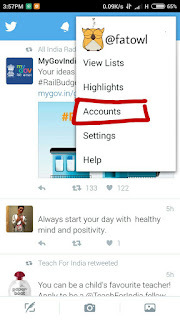 How to login to multiple Twitter accounts on Twitter app on smartphones? On web browsers, we can actively use only one Twitter account one web browser, but on Twitter apps on smartphones, we can add and use multiple Twitter accounts on the same Twitter mobile app, be it on iPhones or Android. However, we can actively use only one account at a time. 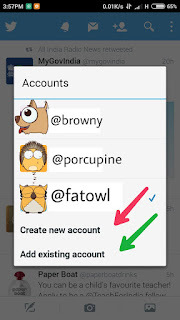 But we can easily swap between the accounts from within the app. 2. If this is the first time it will ask us to login or sign up. Log in with existing account or sign up for a new account. 4. Add new or add existing. 2. Tap on any of the accounts to use Tweet away!